Sephton Water Technology is a research and development company founded in 1982 by Dr. Hugo Sephton to perfect and bring to commercial use the water desalination technology he worked to develop. From 1966 to the founding in 1982, Dr. Sephton developed the technology under various government and private grants while at the University of California at Berkeley and during a two-year license agreement with Envirotech Corporation. Dr. Sephton held several patents at the founding, including one for the Vertical Tube Foam Evaporation (VTFE) process. 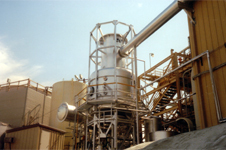 Sephton Water Technology continued VTFE and related technology development with a demonstration project in collaboration with Southern California Edison at their Etiwanda Generating Station from 1982 to 1986 followed by a similar project at their Coolwater coal gasification plant. In 1989, Sephton Water Technology carried out a pilot test of VTFE as a brine concentrator to maintain a test solar pond at Los Banos in collaboration with the California Department of Water Resources. In the same year a demonstration VTFE plant was assembled to distill cooling tower blow-down using waste heat from turbine reject steam at a renewable powerplant owned by Modesto Energy in central California. This demonstration and several follow-on projects operated into the mid-1990’s when State energy deregulation caused the shutdown of this and other alternative energy generating plants. Sephton Water Technology subsequently participated in the design of a stacked vertical tube multi-effect seawater evaporator for the Los Angeles Metropolitan Water District, was granted patents on this and other desalination technology, and made proposals leading to the current work. Sephton Water Technology is currently working with CalEnergy and the United States Bureau of Reclamation to carry out a pilot test of the VTE technology to produce potable water from Salton Sea water using geothermal steam as a heat source. Sephton Water Technology beleives in building cooperative partnerships with other companies, individuals, and government agencies. Faithful execution of contracts and prompt payment to vendors are a matter of course. Dr. Hugo Sephton published dozens of papers in professional journals over his 30 year career describing the technology now being applied. Dr. Hugo Sephton was awarded several patents on VTE and related technology. Rights to those patents still in force are held by the Sephton family. Sephton Water Technology has formed cooperative partnerships with private firms and government agencies to execute many projects. Sephton Water Technology has been awarded research grants by several government agencies both directly and in partnership with industry and agencies. Sephton Water Technology is committed to developing desalination technology that benefits customers, the public, and the environment. All projects in the last two decades have used thermal energy from renewable sources to drive the distillation process.